Yesterday was MyTeenSon Marks 15th birthday. “A cell phone, for Pete’s sake.” is what he said he wanted. He has asked for one, every year for the last 75 years of his life. So we took him out to lunch, and MyHandsomeHusband presented him with a long, extra large box, wrapped with in black polka dot paper, helium filled balloons tied around the middle. It was a real spectacle. “Hmmmmm.” my boy said said. He unwrapped the box and pulled out two paper cups, connected with string. “Um. What’s this?” he said. “Look on the cups and see.” said MyHandsomeHusband. I have to admit…it was pretty funny. He’s a real tease, that man I’m married to. Makes life a lot of fun. 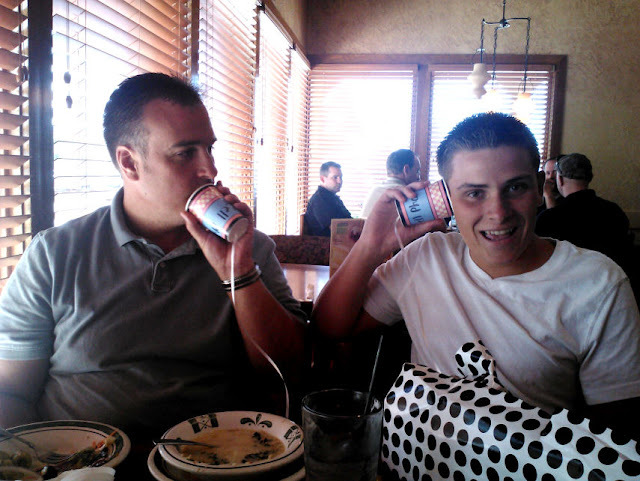 PS…my boy ended up getting his phone later that day. Please send him a congratulatory text at your earliest convenience. This Raspberry Cream Pie just might be my favorite recipe, this summer. The creamy and sweet filling goes perfectly with the tangy raspberry topping. Don’t be discouraged by the fact that it has a pastry pie crust. If you haven’t mastered pie crust making, just purchase a frozen pastry crust. Hope you make it. Hope you love it! 1. Find yourself an unbaked, deep dish, 9 inch pie crust. You can make your own (recipe found here) or you can buy a frozen crust from the store. Marie Callender’s makes a wonderful frozen crust. 2. Prick the crust with a fork, several times all over. Bake according to package directions. I baked mine at 400 degrees for about 8 minutes. 3. Take the crust out of the oven when it is golden brown and let it cool completely. 4. Pour 1 tablespoon corn starch and 1/4 cup sugar into a medium sized sauce pan. Give it a nice stir to combine. 5. Add the package of frozen raspberries, or 1 heaping cup of fresh berries. Pour in 1 1/2 teaspoons of water and 1 1/2 teaspoons of lemon juice. Stir it around to combine. 6. Over medium high heat, bring the mixture to a boil stirring constantly. The berries will break down nicely for you. Let it boil for a couple of minutes, or until the desired consistency is reached. It should be just a bit thinner than pudding. 7. Remove it from the heat, add 1 tablespoon butter, 1/2 teaspoon vanilla and a dash of salt. Let the butter melt for just a bit and then stir it in. Let it all cool completely. If you are in a rush you could pour it into a bowl and set it in the fridge. 8. Place your softened cream cheese into your stand mixer or medium sized mixing bowl. Beat it until smooth. 9. Add 1 C powdered sugar, 1 teaspoon vanilla and a dash of salt. Mix for about 2 minutes. 10. Add 1/2 C sour cream and 3 cups of cool whip. Mix until well combined, about 2 more minutes. 11. Pour the filling into the cooled pie crust. You may have a bit leftover, depending on how “deep” your pie crust is. 12. Once the topping has cooled, pour it over the top of the filling. 13. Pop that baby into the fridge for 1 hour, then you are ready to serve. This looks like your Blueberry Sour Cream Pie but with Raspberry topping. Yum! Can’t wait to try it, maybe even with a graham cracker crust. This looks delicious! I’m looking at making this and the blueberry sour cream pie for our Easter dinner. How would the pies fare if they were made the night before? Is it better to make them the day of? So sorry for my slow response! These pies both work out perfectly made the night before. Good luck! Hope you love them! They are two of my very favorites. I really think it would be just as delicious without the pie crust. I’ll definitely be making the raspberry sauce to go over vanilla ice cream. Oh wow. This pie and Downton Abbey totally go together. 🙂 Thanks for letting me know you loved it! This really sound as delicious as your fresh peach cream pie. I will be trying this! Thanks. Thanks for your question. I would suggest sticking with raspberries for this particular pie. Here is a great White Chocolate Strawberry Pie you might be interested in.